Hostinger is a hosting company, that may be not as big as HostGator, GoDaddy or some others. However, with its 8 worldwide data centers, 24/7 support and a big variety of services, Hostinger has just about enough tools to compete even with the biggest players in the business. As stated in the company’s website, it currently has over 29 million users in 178 countries and gets 15,000 new sign-ups every day - that’s one every 5 seconds! With these numbers, it is clear that Hostinger is company on the rise, and it is very difficult to ignore it. This is precisely why I’ve decided to check Hostinger web hosting services. Looking at the plans in Hostinger website, it becomes rather clear what is its main mission. This company offers cheap web hosting and tries to be competitive by combining superior services quality and low prices. 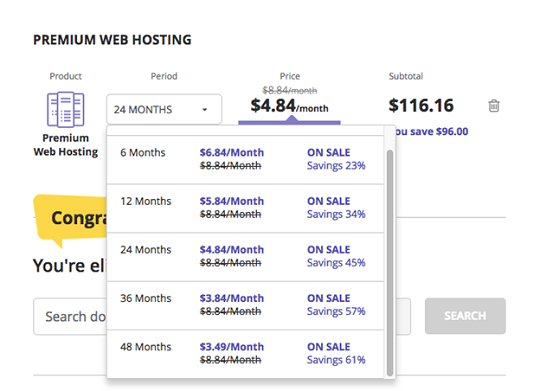 As far as the prices go, Hostinger looks great, with $2.15 a month being one of the best deals you can find. How do the other plans fare up? In the picture below there is a list of all Hostinger web hosting plans and their starting prices. The three plans have varying price points and different features. ‘Single’ plan has limited disk space and bandwidth. In addition to that, you can only have one website and email account. ‘Premium Web Hosting’ has all of those things - unlimited. And finally, the ‘Business’ package has all the perks of the ‘Premium’ package but also includes processing power, daily backups and a free SSL certificate. Between the three, ‘Premium’ is the most popular plan. It comes as no surprise, as it offers unlimited websites and email accounts as well as unmetered disk space and bandwidth for a good price. Also, you will get a free domain name, which is a great plus. This is the plan I decided to test. As you can see, the low $3.49 price is only available if you purchase a 48-month plan. However, the prices won’t increase too much even if you choose a shorter package. I’ve decided to contact the customer support to find out more about the features and the prices of Hostinger hosting services. I’ve had a couple pleasant surprises here. First of all, the chat wait times were practically nonexistent, it took me only a few seconds to get connected. Secondly, it turns out that after your plan runs out, the renewal prices don’t increase. You will pay the same amount of money for the same period of services as you did in the first invoice. This is quite rare and very encouraging. With all that in mind, it was time to check the Hostinger web hosting performance. Hostinger panel is very easy to use and pleasing to the eye. Everything is easy to locate. 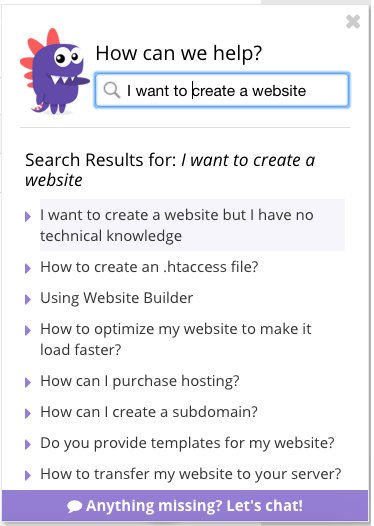 At the bottom, there is always a menu that can answer many of your questions - or direct you to the chat instead. It’s simple but very efficient. As far as the performance goes, Hostinger put on a great show. In the few days of testing, Hostinger servers haven’t been down once and their response time have been really good. Same with page load times. I put on a Wordpress website and tried to test it with Pingdom’s tools. The results were very pleasing. In case you'd like to know more details about Hostinger's user interface, performance, and customer support, be sure to look at this review by Satori. 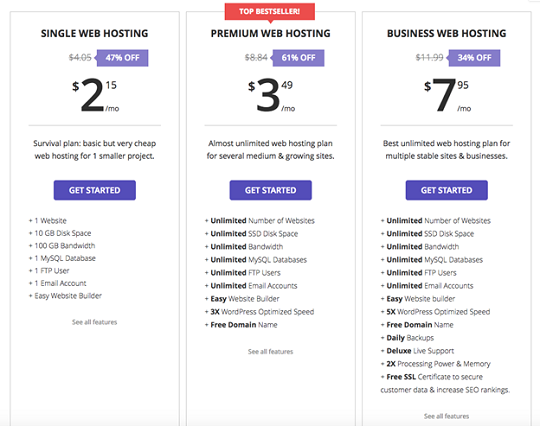 Apart from the above, you will also find a detailed list of advantages and disadvantages of Hostinger as a hosting provider, as well as an exclusive coupon code for a 15% discount on your first purchase at Hostinger. Hostinger web hosting turned out to be inexpensive, easy to use and very powerful. Their advertisements may promise low starting prices but it doesn’t end there. This hosting provider also offers an easy to use panel, friendly renewal costs and superior performance. With 15,000 new signups every day, Hostinger are one of the fastest growing companies in the business. With these services, it is easy to see why.